The world's first digital mercury sphyg with auto measurement option, makes transitioning to a 21st century device from a traditional mercurial sphyg a snap. The unique backlit LCD display mimics the appearance of a traditional mercury column, but can be easily read in low light conditions. A second numberic LCD displays pressure, pulse, and a host of other vital information. 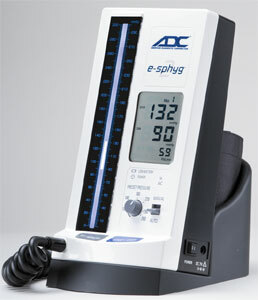 The e-sphyg 2 features auto/manual settings. 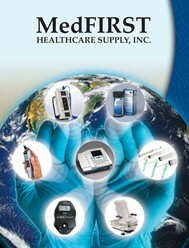 In manual mode, blood pressure is measured using the traditional, time-tested auscultatory method. Auto mode can be used with child, adult, and large adult size cuffs to automatically obtain systolic/diastolic pressure and pulse in about 1 minute. GRAPHIC back lit mercury free LCD that mimics the appearance of a mercury column for easier interpretation. 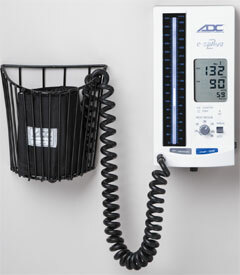 Multi-function alpha-numeric LCD displays air pressure, deflation rate, systolic, diastolic pressure and pulse (auto mode only). Industry first manual mode allows practitioners to use the time-tested auscultatory method with ANY sized cuff. Automatic inflation to pre-set levels simplifies use. ECV (electronic control valve) precisely controls deflation at one of three pre-established rates for (manual mode) optimum results. NICAD rechargeable battery provides about 200 measurements on a single charge. Latex free TPU coiled tubing for convenience.